Recycling of municipal waste is increasing in Slovenia. In 2012, almost 40 per cent of municipal waste was recycled. Disposal of waste has declined over the years, 42 per cent of municipal waste was landfilled in 2012. Incineration remains minimal, at slightly above one per cent. This indicator shows the quantity of municipal waste per capita in Slovenia and other EU countries. Municipal waste is defined as waste from households and other waste similar to household waste by its nature and composition. According to the Environmental Protection Act (Official Gazette of the Republic of Slovenia, Nos 39/06 and 70/08-ZVO-1B), municipal waste is collected and transported within the obligatory municipal public utility service of environmental protection. Municipal waste treatment is regulated by the Decree on waste (Official Gazette of the Republic of Slovenia, No. 24/12). Municipal treatment in Slovenia is organised within obligatory municipal public utility services for collecting and transporting municipal waste, treatment of mixed municipal waste and landfilling of the remaining waste. 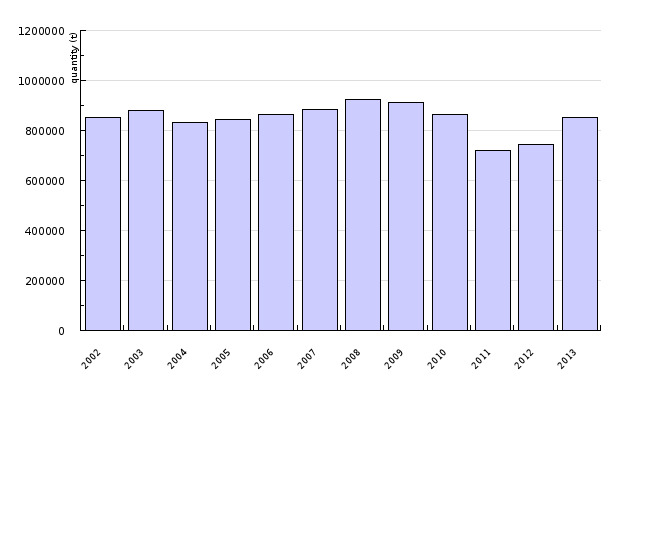 Statistical office of the RS of Slovenia, SI-STAT data portal, Environmental indicators, 2014. Separate collection of waste at source and effective treatment (mechanical, biological, thermal) of the waste remaining after separate collection. To increase the preparation of waste paper, metals, plastic and glass from households and, to the highest possible extent, from other sources from which waste flows are similar to household waste, for reuse and recycling by at least 50% of the total mass by 2020. Along with economic growth and growing purchasing power, larger quantities of waste are being generated in households than ever before. This is reflected in the increased use of natural resources, as only a third of generated waste is being recycled. 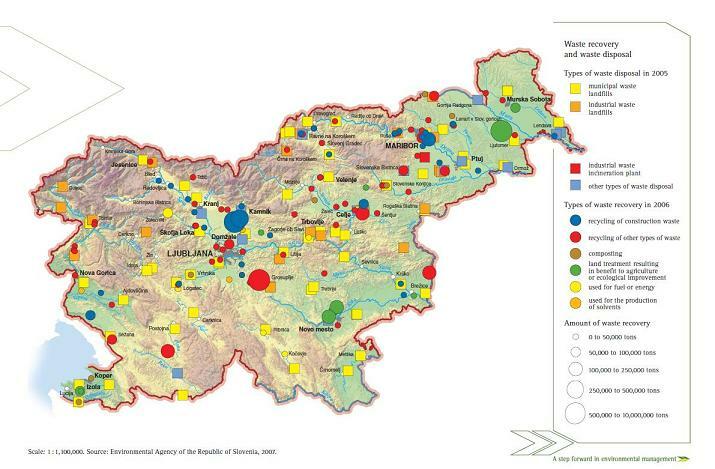 In Slovenia, more than 400 kg of municipal waste per capita, per year is generated. In 2013, 853,388 tonnes of municipal waste were generated, which amounted to 414 kg per capita. 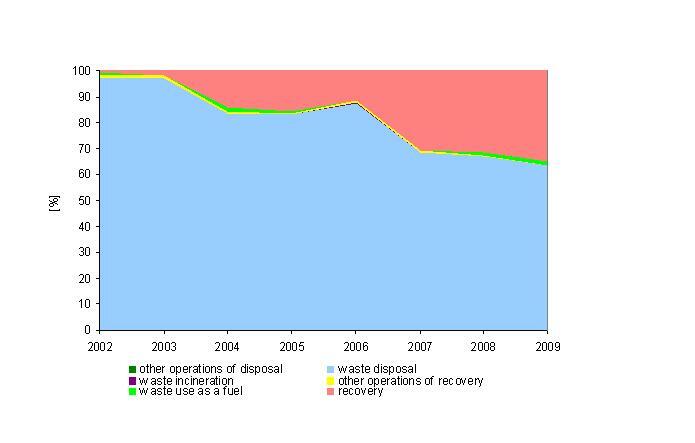 The quantity of generated waste increased by 17% in the period 2003–2008. In 2009, it decreased slightly for the first time since 2003 and continued to decrease in 2010 and 2011. In 2012, the quantity of generated municipal waste started to grow again. In recent years, the share of separately collected fractions of municipal waste has been increasing. In 2012, it amounted to almost 40% (the share of collected mixed municipal waste was 60%). Door-to-door collection of separated waste packaging and biodegradable household waste, waste glass and paper as well as hazardous and bulky waste facilitate further treatment of separately collected waste (recycling and processing). In this way, we contribute to the preservation of natural resources and the reduction of negative impacts of landfills on the environment (e.g. CO2 and other landfill gas emissions and leachate, impacts on groundwater). The recycling of municipal waste has been increasing in recent years. In 2012, almost 40% of municipal waste was recycled. Incineration remains minimal at slightly over one per cent of total collected municipal waste. Despite the efforts to follow the hierarchy of waste management as closely as possible and dispose of as little waste as possible in landfills, we still dispose of more than 40% of generated municipal waste. Therefore, the strategic document in this field proposes certain measures that would, inter alia, enable the share of recycled municipal waste to increase to 61–64%, the share of incinerated waste to increase to approximately 25% and the share of municipal waste dumped in landfills to decrease to 11–15%, all by 2020. Achieving these goals will require investments in infrastructure estimated at EUR 291 million for the period 2007–2015 (cohesion funds, state and municipal budgets) and EUR 200 million for the period 2016–2020. In addition, greater attention will need to be given to raising public awareness. Quantities of generated municipal waste vary considerably between the EU Member States, which is largely a consequence of various socio-economic conditions and levels of environmental awareness. In 2012, an average of 487 kg of municipal waste per capita was generated in the EU-28. Data processing methodology: The graph in Figure OD1-1 presents data on the collected quantity of municipal waste in Slovenia gathered by the Environmental Agency of the Republic of Slovenia and by the Statistical Office of the Republic of Slovenia. Quantities of municipal waste have been converted to data per capita, taking into account the size of population as at 31 December of the current year.